This custom home will take your breath away! Soaring ceilings, huge cypress beams, heart of pine flooring, and so many thoughtful, custom touches. 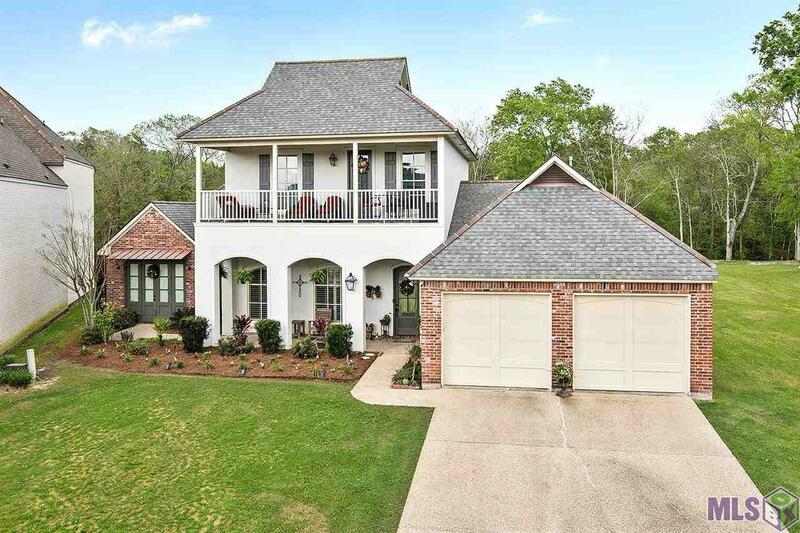 As you enter into this beautiful, New Orleans style home and you'll notice the spacious living areas. Kitchen features granite counter tops, two ovens, and a commercial range. Great island with lots of storage. The dining room is lovely and the living areas boast so much natural light. Beautiful, plantation shutters on the windows and great views of the backyard. Downstairs is a split floor plan for bedrooms - two bedrooms and a full bath on one side and the master bedroom, half bath, laundry and drop zone on the right. One bedroom has a separate entry, and could be used as a home office. The master bedroom with en-suite bath is spacious and bath features dual vanities, soaking tub, and large closets. Upstairs you'll find a great layout again! Spacious landing zone, two nicely sized bedrooms, a full bath, a functional office nook, and great views! All of this on a quiet, dead end street with golf course views, lovely balcony, sprinkler system in front and great covered patios. And, this home backs up to a creek and wooded area, so you also get privacy. This home did NOT flood. Make your appointment today. *It is plumbed for an outdoor kitchen and currently has a natural gas grill and outdoor sink. Interior: Attic Access, Built-In Bookcases, Cable Ready, Ceiling 9&apos;+, Ceiling Fans, Ceiling Varied Heights, Computer Nook, Inside Laundry, Sm Window Trtmt.